Brand Flights skillfully provides public relations support on important issues. HARRISBURG, Pa., June 8, 2010 — Integrated Water Technologies, Inc. has proven the effectiveness of FracPure™ Produced Water Remediation for the Pennsylvania Department of Environmental Protection. FracPure™ solves problems in hydraulic fracturing water supply, handling and disposal, while eliminating long term environmental liabilities for natural gas companies. The patent pending, FracPure™ remediates flow back brine into cleaned water exceeding all EPA and State drinking water standards of 500 parts per million of total dissolved solids, as well as Pennsylvania’s new proposed wastewater requirements set to take effect January 1, 2011. FracPure™ averaged significantly less than 300 parts per million of total dissolved solids, which was safely returned to the water table and into rivers and streams. The only other byproducts are 99.7% pure salts used for water softening and liquid salt for erosion control and de-icing of roads, which are being sold today. FracPure™ is the most cost effective water management solution because it reduces water supply costs by creating new sources, reduces trucking costs with on-site treatment and recycling, and reduces plant operation costs by creating commercially sold salt products. 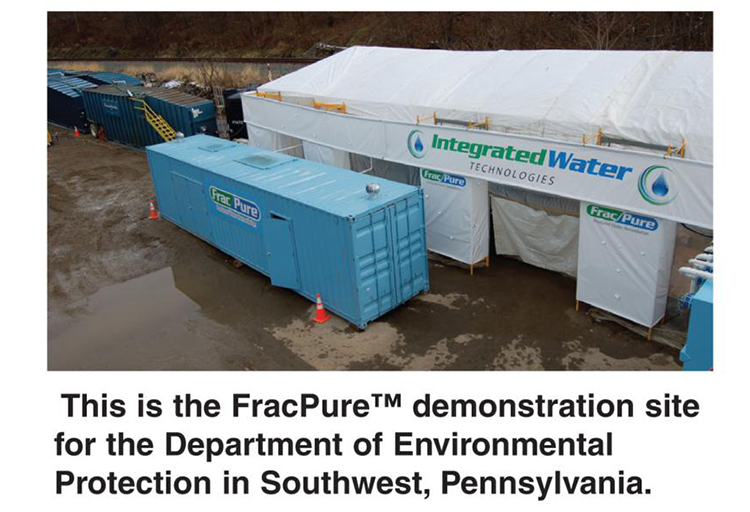 Integrated Water Technologies is currently engineering and permitting Centralized Treatment Plants and FracPure™ Mobile On-site Treatment Units to provide 100% frac water recycling, production brine disposal, pit water filtration and disposal and source water supply throughout the Marcellus Shale. Additional plants will be located throughout the United States to meet growing drilling and production demands. For a complete report on the PA DEP demonstration go to www.FracPure.com or download pictures and the release at the NEWS & MEDIA section of www.IntegratedWaterTech.com.